Adam Curtis’ basic insight in The Power of Nightmares (PoN) is that similar moral philosophies – decrying the moral degeneracy of consumerism and the godless absolutism of State communism – underpin the politics of both neoconservatism (Bush, Reagan, Thatcher, etc) and radical Islam. Collaborating to repel the USSR from Afghanistan, each interpreted success – including the collapse of the Soviet bloc – as down to them. 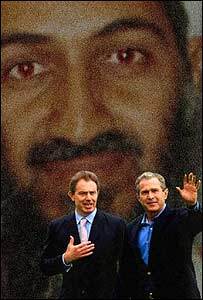 Their divergent fortunes since have turned them into protagonists in the ‘War on Terror’. Now that their promises of better lives are no longer believed, the political elites can only offer protection against evil – with society uniting in fear and sanctioning whatever measures are fantasised to ameliorate it. Not only the elusive WMDs, but also Al-Qaeda, don’t actually exist. Hot stuff for mainstream TV (if that’s any recommendation …). The main strength of the series was its visual style and structure. Profoundly enriching a rather dry narrative by weaving together archive news footage with excerpts from popular culture, this editing technique parallels the form in which information is encountered and assimilated by ordinary people in the media age. Further, given that the ‘politics of fear’ require the routine exaggeration of threat, it was refreshing to hear it stressed that the propaganda must not be swallowed by the elites – and that it’s the leader’s job to persuade us of ‘great myths’ in order for society to survive (and, coincidentally, for the elites to flourish). So much for the ‘integrity’ of Bush, Blair and power politics in general. In most respects, however, PoN was fatally selective, oversimplistic and tendentious. Clues were liberally (and literally) scattered thoughout in assertions about what ‘we’ do, ‘they’ think and ‘everyone’ believes – constantly generalising its narrow focus and universalising the positions of its comfortable Westerm middle class primary audience. This is bourgeois liberalism’s history as a ‘battle of big ideas’ at its cleverest and most interesting. But its ideology – like the forms of governance it inspires – is constitutionally unable (in all senses) to acknowledge that the control and disposition of resources are central to political change. Thus neoconservatism is best seen as the political wing of neoliberalism, which demands that corporate market imperatives operate unhindered – whether this be in North America and Europe, the Latin dictatorships, the thin veneer of secular Islamic democracies or the modernised barbarisms in Saudi, Iran, China and Eastern Europe. A hell on earth of increasing poverty, misery and suffering for billions of human bodies is all that neoliberalism can deliver, along with lives wasted on trivial consumption in a shrinking proportion of ‘First World’ populations. The series merely reproduces an alternative nightmare of cynical reactionary pessimism. Even in terms of ideas and idealism, PoN was dishonest. Many influential 20th century critiques of Western popular culture were ignored, from Freudianism to the Frankfurt School to Christopher Lasch (The Culture of Narcissism), as was the overwhelming tradition of tasteful class-bound contempt for ‘the mass’ – felt by liberal elitists as much as marxist intellectuals and their Leninist dictatorships, along with adherents of other regressive fundamentalist religions. Its main claim to originality (in the title) requires amnesia towards thousands of years-worth of the political mobilisations of nightmares – the Crusades, Spanish Inquisition, witchhunts; Stalinism and McCarthyism; Nazism and racial essentialism; nationalism, myths of foreign contamination and cultural racism (or even primitivist ecology, political correctness and identity fundamentalism). The emphasis on fantasy, lies and mystification was at least thought-provoking in terms of how they get away with it – not only in sidestepping popular resistance, but in engineering the appearance of collusion via voting and consumerism. Unfortunately, in cutting off the entire spectrum of critique, PoN spontaneously reproduces the commonplace institutional process of presenting an extremely narrow range of ‘loyal opposition’ as the only conceivable alternatives. Curtis’ previous BBC2 series, The Century of the Self (2003), was very enlightening on the history of PR and advertising campaigns, and could hardly avoid some of the analysis of capitalism missing-in-action in PoN. Better still, the forthcoming feature-length The Corporation (Canada 2004, dirs. Jennifer Abbott & Mark Achbar – the latter responsible for the Chomsky documentary Manufacturing Consent) understands its subject as exhibiting all the traits characteristic of psychopathy if observed in individuals. Of course, even the best of liberal psychology is just as partial and compromised an interpretive tool as its philosophy – shown here in a voiceover musing that corporations “seek their narcissistic reflection” in fascism”. More pertinent is their commitment to it in practice – both in internal functioning and as by far the most conducive political environment. PoN could not make even this simple observation without exposing its bankrupt idealist premises. Curtis insists that ‘ideas shape history’. Why then did he have to, so artfully and artificially, hermetically seal off these particular ideas from all their material, as well as ideological, context? On the surface, because he wants to present himself as so much more clever, liberal and knowledgeable than us poor mugs – and the BBC wouldn’t have gone for the more accurate title: ‘A pair of Right scares’. Television review published in Freedom, Vol. 65, No. 22, November 2004.